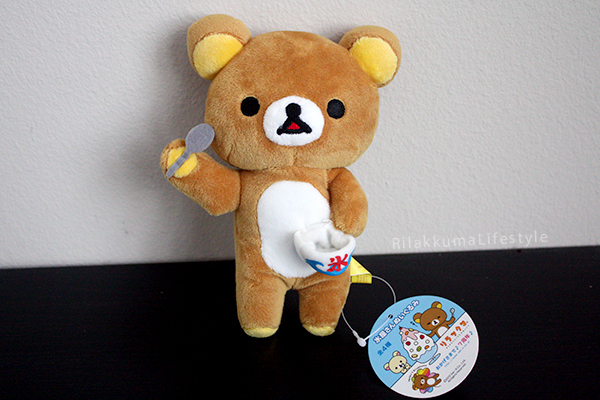 Well, it keeps getting warmer and warmer around here, so to chill out a little bit, say hello to Shaved Ice Rilakkuma! 氷(kōri) means “shaved ice”, and it’s usually served with a light syrup – yum! Tag art! 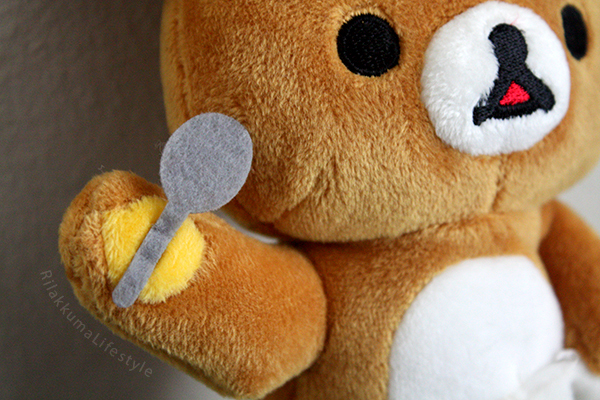 Looks like Rilakkuma is looking forward to a huge dessert! Lovely! Looks like he’s ready for seconds (or thirds) haha. 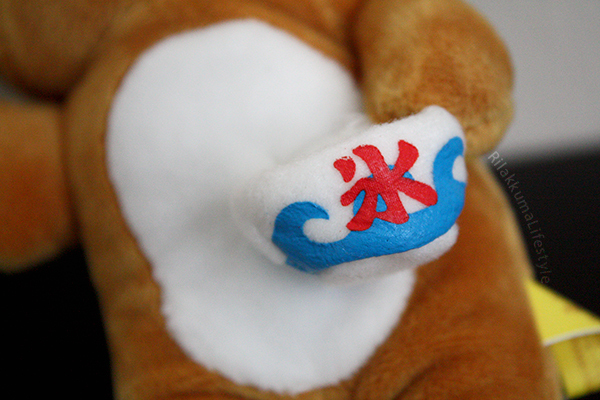 Fansclub released this plushie in July 2010, but what’s really interesting about this plushie is that he was part of the 7th Anniversary Happy Rainbow series – wow! I’m not sure what all shaved ice has to do with the rainbow series (I always thought they featured more ice cream in that line), but it’s really beautiful and one of my favorite series because of the colors :) The 7th anniversary series has always been on my wishlist, so I’m so glad to have this plushie in my collection! The shaved ice motif actually reminds me a lot of the Harajuku Rilakkuma Store opening plushie from back in 2012! Again, this beautiful plushie was courtesy of the ever generous Rilakkuma fan Trinie!! 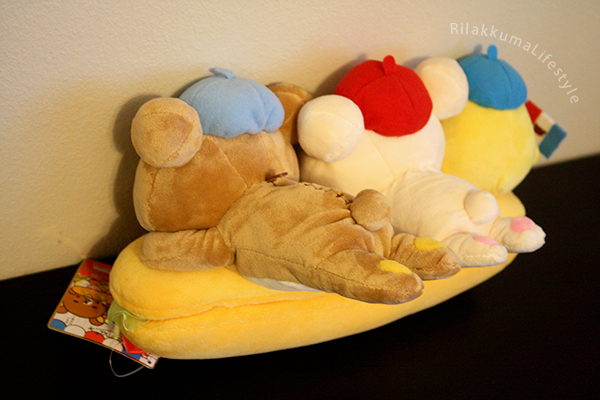 Thank you so much for sharing your love of rare and hard to find Rilakkuma plushies! Also, I tweeted about this back when it was announced in January, but how BEAUTIFUL does this Ecole Criollo x Rilakkuma collaboration cake look? What a wonderful heart theme! Wow, I really can’t believe how immaculately this was cut! So much more to come! 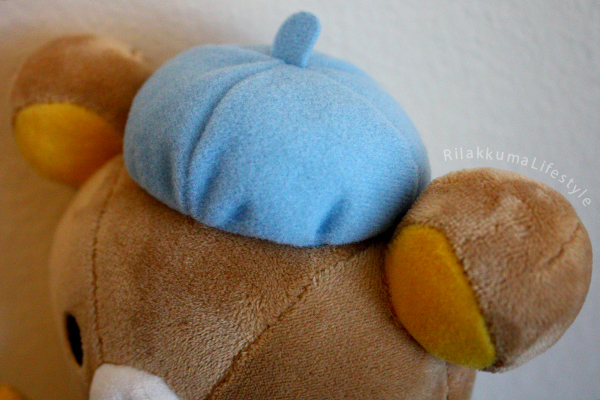 Can’t wait to share more Rilakkuma plushies with all of you! 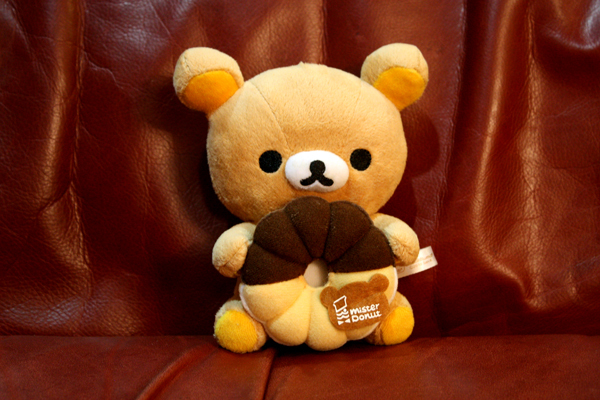 Bonjour Series Rilakkuma Plushie – Store Exclusive! Ahhh I’m so excited to share with you all this plushie I received this week! Sharing one big sub sandwich! Kiiroitori’s holding the Rilakkuma variation of the French flag! 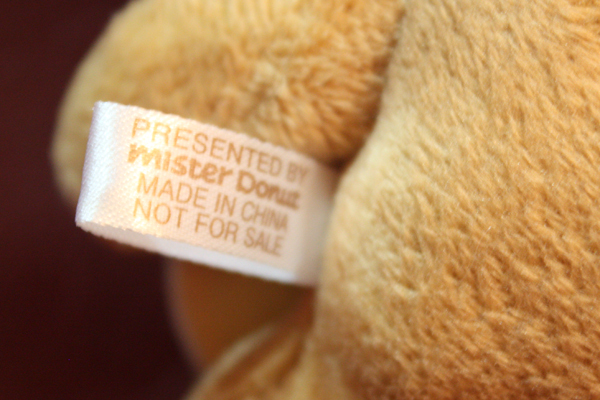 The back of the plush, with their little bear buns hovering in the air. Speaking of buns, the sandwich bun is incredibly soft and fuzzy! Tag art! Looks like the illustration shows little kuma-toothpicks that hold the sandwich together, too! 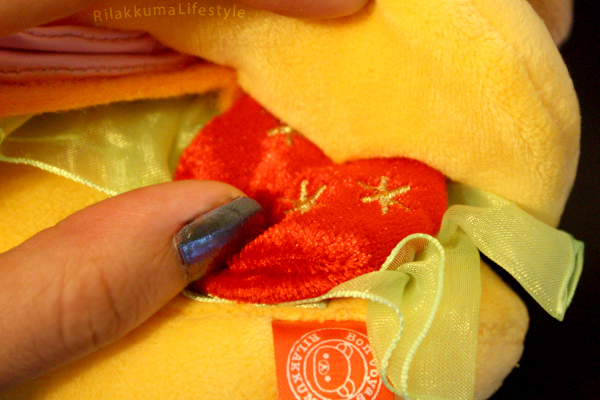 Wow, even the tomato slices hidden inside have little embroidered details! 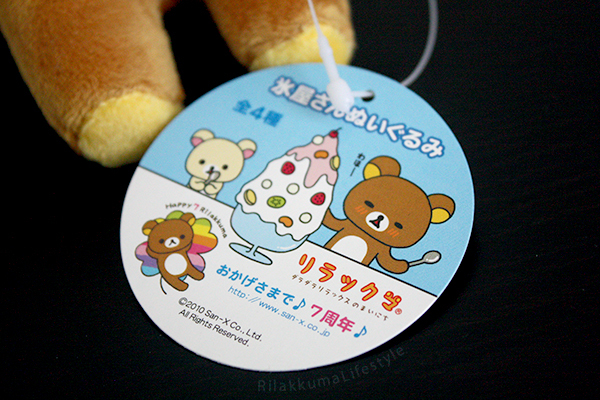 This set was the Rilakkuma Store exclusive for the Bonjour Series, and was released February 19, 2010, which was also the weekend the Tokyo Station Rilakkuma Store celebrated its 1st anniversary! At the time, only the Umeda and Tokyo Station branches were open! Wow, and I was busy in the middle of my undergrad and hadn’t even heard of Rilakkuma back then haha how the times have changed. This plushie is my ultimate dream piece, and has been at the top of my wishlist since I first started collecting. I love the Bonjour Series a lot (mainly because of its baguette-centrism), and I’m so lucky to have obtained two plushies I really dreamed for (this and the Caravan edition) during this past month! This also means I’ll have to rebuild my wishlist again haha. Huge thanks to Ariel for being so diligent in sending me links for Japanese auctions for this plushie!! I’ve seen 4 separate auctions for this plushie come and go (way above my price range) since the summertime, but I was finally successful with this one and it’s so perfect! Thanks again for keeping an eye out for me! Hopefully one day in the future, I’ll get to visit France, and I’ll bring these two along – they’d blend right in, no problem! Bonjour Series Rilakkuma Plushie – Caravan Edition! Is it cheese? Is it honey? 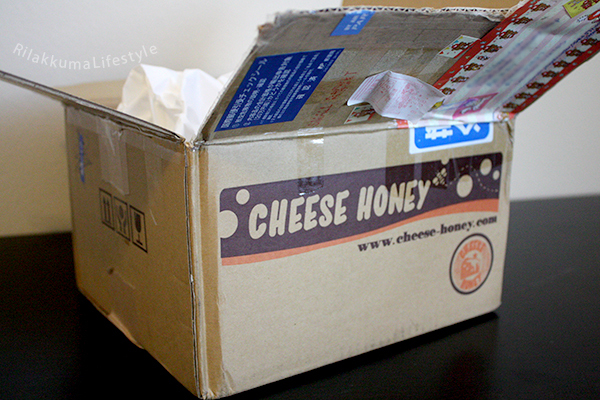 Who could be inside this Cheese Honey box? It’s Bonjour Rilakkuma – Caravan Edition! This is a plushie I’ve wanted since I first started learning about Rilakkuma a year ago! And his pocket lining has both blue and red polka dots, compared to the usual light blue only spots! Tag art! 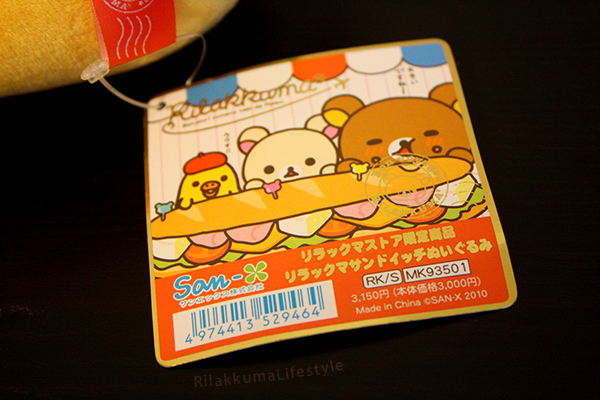 The Rilakkuma on the tag looks more like the regular release, but his paper bag says “La boulangerie de Rilakkuma” (Rilakkuma Bakery). 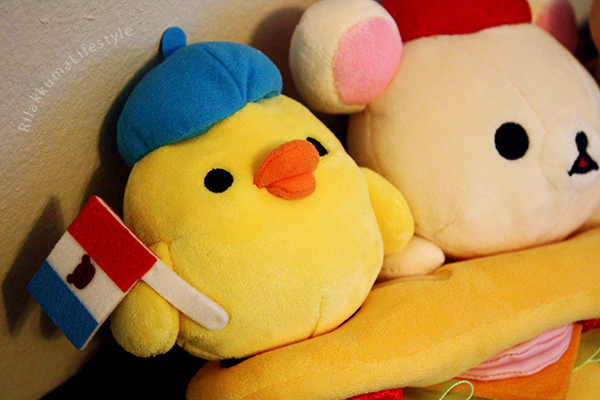 This plushie was released as a part of the French-themed Bonjour Series in March 2010. 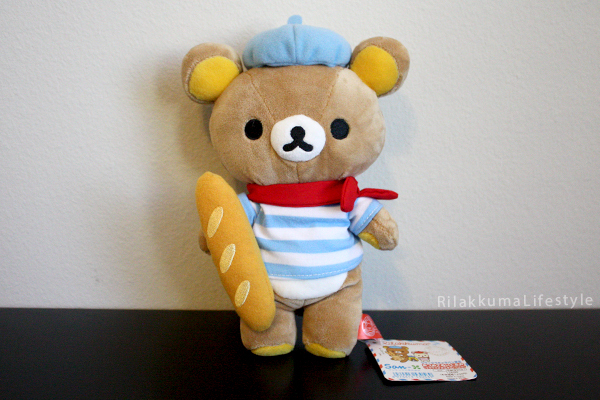 Appropriately, this Rilakkuma’s color scheme matches the French flag: red, white, and blue! He is a Caravan plushie, which means that he was part of a special additional release during the Bonjour Series time. The Rilakkuma Caravan is a seasonal affair where San-X holds special Rilakkuma events at stores and locations all over Japan – not just the 8 Rilakkuma Stores! They bring out the big Rilakkuma/Korilakkuma/Kiiroitori suits, and there’s a chance to take photos. Most important (for me) is that they also sell these special plushies that are design variants of the major series of the moment. Right now, the caravan is Rilakkuma Wonderland themed! This Bonjour plushie is my third caravan plushie (my others are the Aloha Caravan and the Egg Caravan). Yay, I’m so excited to have won this! Liemzie (Tea Two Sugars Please) has the most incredible luck in the world and found not one, but TWO of these super rare bears (WOW) and put this one up on auction. 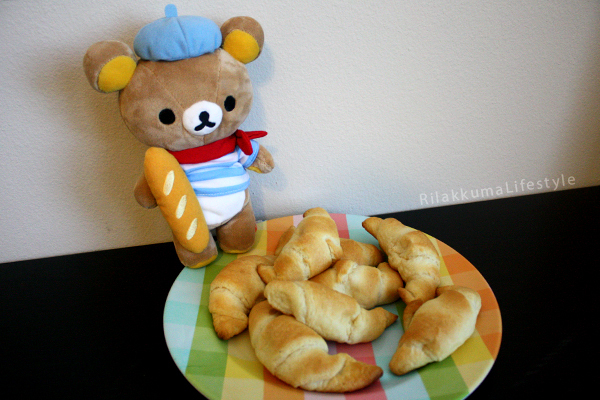 To celebrate this plushie, and maybe help him feel less homesick for France (hahaha), we baked some croissants! Well so actually, croissants are thought to have originated in Austria, but they been of a staple of French bakeries for centuries! 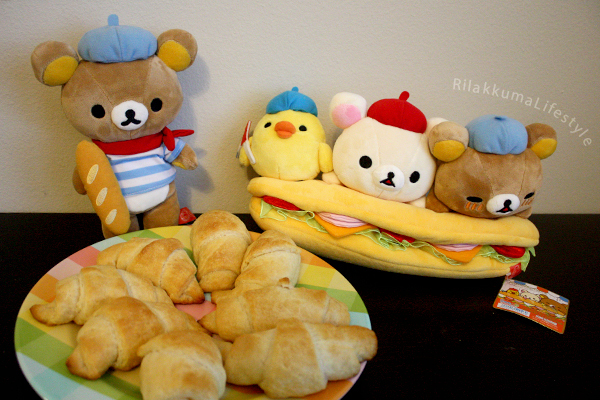 So welcome home, Bonjour Rilakkuma! Speaking of croissants, this is one of my favorite Disney shorts – it’s croissant themed! 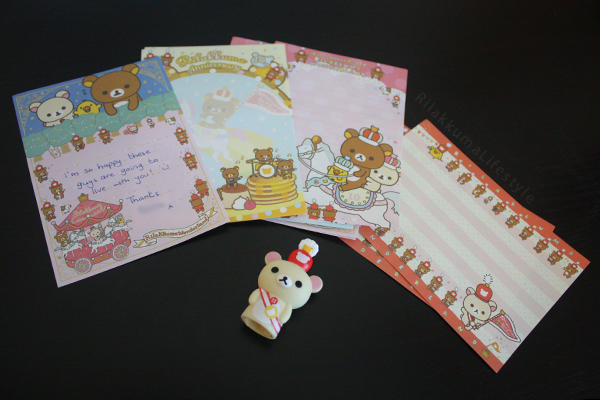 Rilakkuma Wonderland stationary and a Korilakkuma finger puppet! Ahhh so awesome! Thanks so much, Liemzie! Also hahaha, if you look closely at the stationary design second from the left, there’s a Rilakkuma riding a horse in the background that looks just like the Rilakkuma Wonderland Store exclusive… except he has teeth like the Wonderland Caravan plushie! 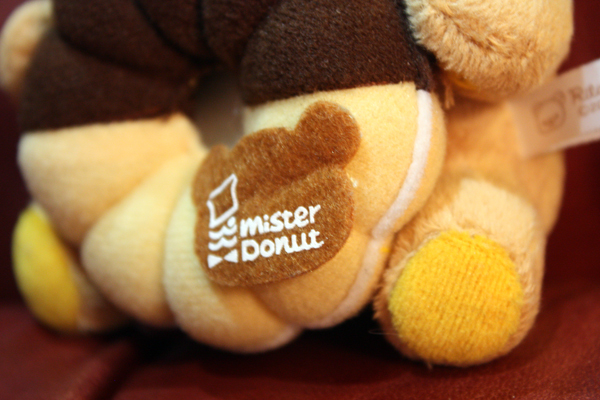 I wonder if Rilakkuma’s teeth are going to be more and more visible now? Whew! 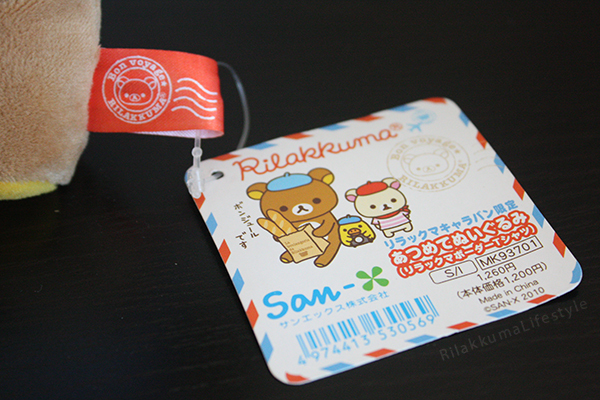 Opening my mailbox and finding Rilakkuma stuff always makes my week! :) :) :) Which is just in time because I have my first medical school exam tomorrow! Maybe I’ll bring a Rilakkuma along for good luck hahaha. I’ve been on a fashion kick recently, though maybe spending money on anything that’s not Rilakkuma feels bizarre to me. 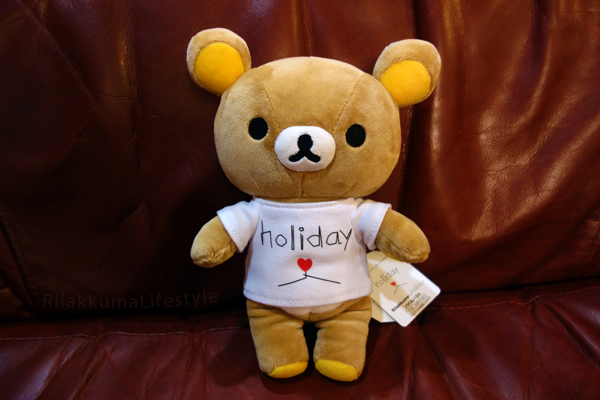 Anyway, here’s a fashion-related Rilakkuma from a cute collab: Holiday x Rilakkuma Plushie! How stylish! Took me forever to figure out what it was for though since “holiday” is such a generic term – googling at first just brought up stuff about the Happy Holiday Picnic series. What a nice t-shirt! They also came out with a black t-shirt version! 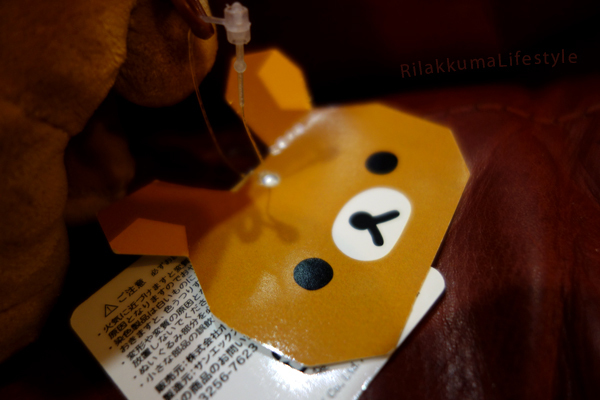 Teehee, even a special Rilakkuma face in the shape of the Holiday logo as a tag! 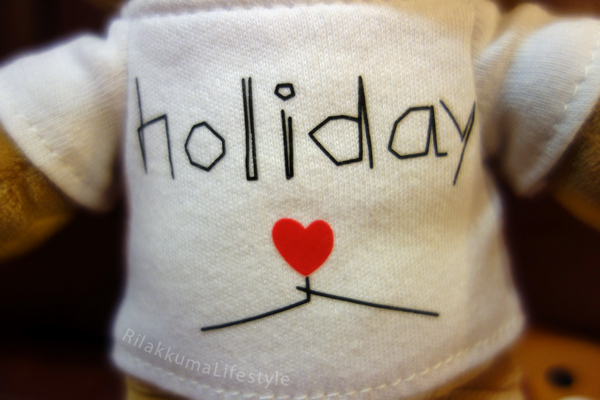 Thanks to Kumadokidoki for pointing out to me that he has a special pocket lining that says “Rilakkuma <3 holiday”! We picked him up at the Umeda Rilakkuma Store! He was part of a collaboration with fashion line Holiday back in 2010! 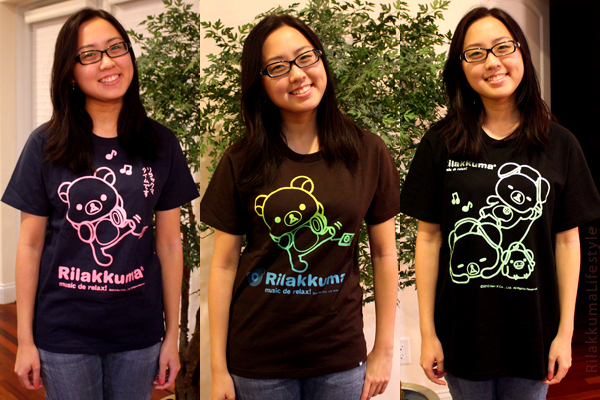 Speaking of fashionable bears, here’s are few shots of the Rilakkuma apparel we also picked up while we were in Umeda! Thanks to my sister Rachel for modeling them all! 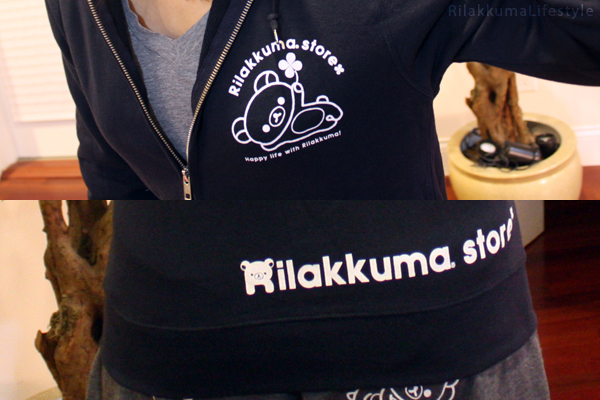 A special Rilakkuma Store jacket released in November 2011! Top: front detail, Bottom: back detail. 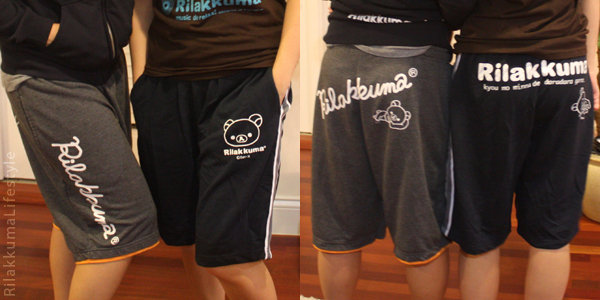 Rilakkuma shorts! Everyone in my family has a set for themselves. Mushroom Rilakkuma & Squirrel Korilakkuma! 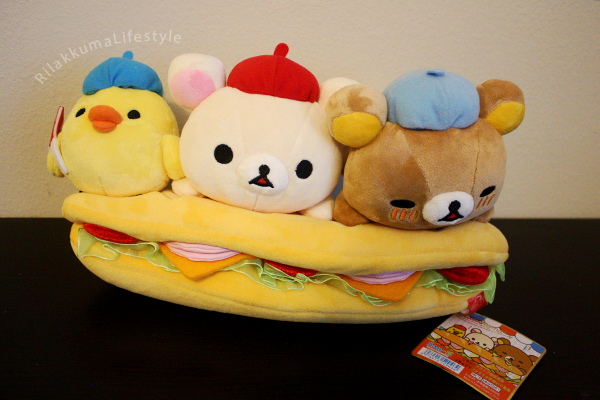 New arrivals: Mushroom Rilakkuma and Squirrel Korilakkuma! This set was a San-X Net Shop exclusive from October-November 2010, as a special release from the Forest Series. I think Simon’s planning on planting him a flowerpot haha. One of my favorite aspects of this release is that the San-X Net Shop manager came out with a series of really silly blog posts/photos featuring the Mushroom Rilakkuma: waiting for the elevator, appearing from behind a table, chilling on a staircase, and being used as an arm rest. I guess the San-X employees love him a lot too! These photos doesn’t do her justice – her squirrel suit is so soft! 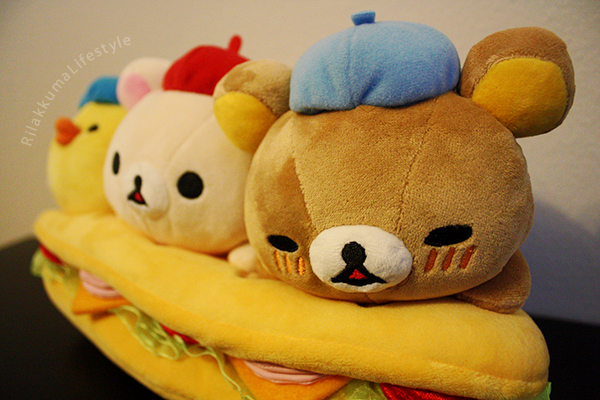 They are both pretty huge: Mushroom Rilakkuma (Shroom Koom? Mushkuma?) is only 24 cm tall, but with a 27 cm diameter, he’s much rounder/wider than everyone else. Squirrel Korilakkuma towers over everyone else at half a meter! They will be going to Simon – we actually really lucked out on this purchase because we weren’t even looking for this set when the opportunity presented itself! We were just looking into the Misdo plushie, and it turned out that the seller was just liquidating their Rilakkuma stock in general. Wow!